Sapphire Beach best beach front unit in D building is calling. Time to answer!. Welcome to paradise! 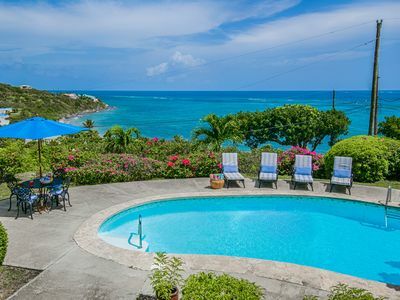 The first sweeping views from the hill overlooking Sapphire Beach will take your breath away. Once inside the beach level condo you will know you are home! Renovated in September 2016 we are pleased to offer our beautiful space for you to enjoy. Our condo has a bright open floor plan and includes all the comforts of home. Gorgeous dark tile throughout ties in the mahogany from the exterior and the professional decoration, color combinations and details make this condo unique in so many ways. Located in D building near the end of the complex. 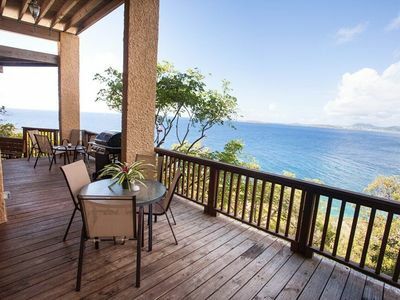 Here you have easy access to the pool, a quiet beach and unobstructed views of the Caribbean sea with St. John and Tortola in the distance . 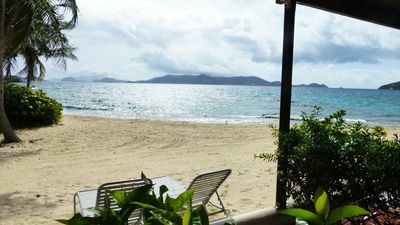 A short walk to your left from the patio will take you in front of buildings A-C where you will find a volley ball net, expanded beach, the dive shop and the Sapphire Beach Bar and Grill. Plenty of sunshine as well as plenty of shade from the Sea-grape and palm trees can be found on the beach. Whether you want to catch some rays or sit quietly under a tree for an afternoon nap, you have all the room you'll need to enjoy your day right here, right outside your patio door at Sapphire Beach. The beautifully remodeled kitchen has hardwood cabinets, quartz counter tops, a gorgeous back splash and stainless steel sink. New stainless steel appliances include a full size microwave, stove/oven and refrigerator with an ice maker and water dispenser. 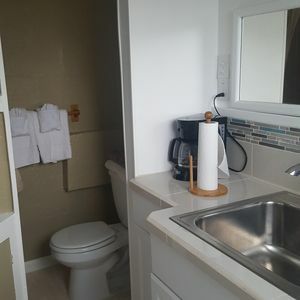 A blender, coffee pot, toaster and all the necessary pots and pans, dishes and utensils for your comfort and convenience are included. Basic spices such as salt, pepper, Italian seasoning, garlic powder, garlic salt, basil and others are found above the sink. Enjoy relaxing in the living room on comfortable furniture and listen to and watch the waves roll in. A brand new 40" flat screen LED TV that includes over 20 channels is also available. There is a dinning room table and chairs where you can enjoy your meals, play games or set up your laptop computer to catch up on those emails you couldn't quite get to before you left. WIFI is included with the condo. At the end of the day close the blackout shades in front of the wall of windows facing the ocean for privacy. The spacious bathroom offers a new walk in tile shower with river rock floor. A single quartz sink and counter top sit upon a gorgeous vanity offering plenty of counter space and storage drawers. Included are bath towels, hotel sized soaps and shampoos to help you settle in. A hair dryer is also included for your convenience. The bedroom room has a new king size bed, side tables with a lamp. Opposite the bed, a desk and drawers is available for clothing storage. A large closet is available for hanging clothes and suitcase storage. Room dividing panels between the bedroom and living room space can be closed for more privacy. Relax on the private patio in comfort that overlooks the gorgeous white sands and the calm crystal clear waters of Sapphire Beach. 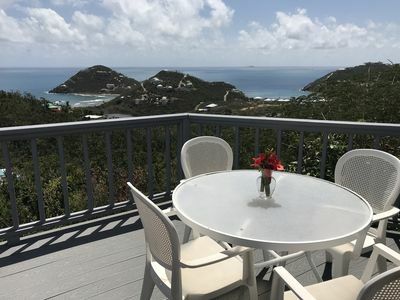 Catch the sunrise over St John while sipping your coffee and at the end of the day enjoy a glass of wine with unobstructed views of the Caribbean sea and the lights of neighboring islands of St John, Tortola and other British Virgin Islands. No detail has been overlooked. 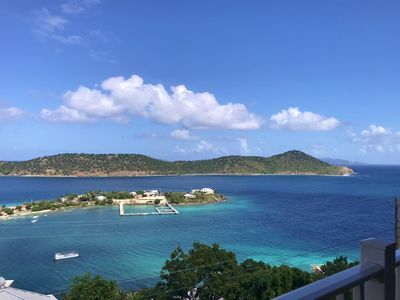 Our rental comes with over-sized beach towels, a beach bag, a small insulated cooler and snorkeling gear all located inside the condo and beach ready. We have WiFi so you can use your tablet, smart phone or laptop to stay connected. The Dive In shop on the beach is open for business. 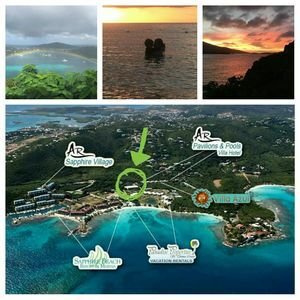 Here you can rent kayaks, stand up paddle(SUP) boards, snorkeling gear and foam beach floats. Sun screen lotions and sunglasses are also for sale. 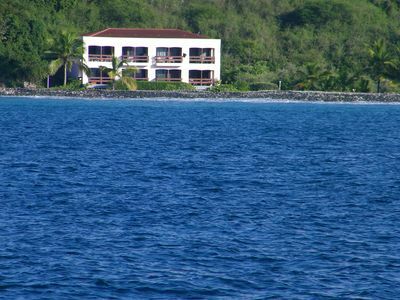 At Sapphire Marina day excursions for fishing or visiting the BVI's can be booked. You depart right next door. Jet ski rentals and para-sailing is also available. The Sapphire Beach Bar and grill has expanded! The huge covered bar area has live music several days a week. A full bar with a drink menu full of island drinks, full well options for mixed drinks and beer are for sale. The Coffee Bar attached to the beach bar is open daily from 7am-4pm. Coffee drinks and frozen yogurt are available. The poolside restaurant at Sapphire Village--- Slices Cafe specializes in homemade pizza and dishes with fresh locally sourced ingredients. They are serving lunch, dinner and drinks just a short 5 minute walk up the hill past the marina and 'F' building. 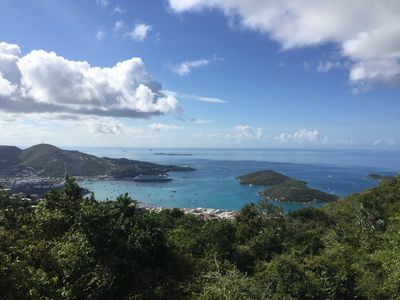 The island of St. Thomas has a growing "Foodie" culture, including now offering a walking food and culture tour. Menus for other local restaurants are located inside the condo or we would be happy to recommend some our favorite places! 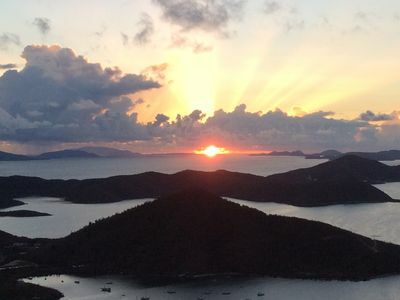 Day sail over to St. John and visit Caneel Bay and Trunk Bay. 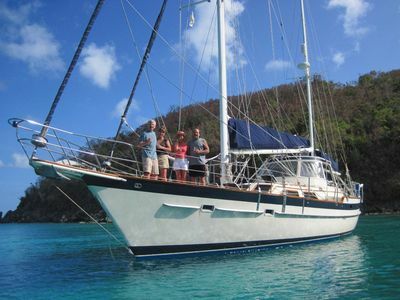 Cruise the Bad Kitty catamaran to Jost Van Dyke in the BVI, home of Foxy's and the famous Soggy Dollar Bar. Speedboat to Virgin Gorda and The Baths. Dive PADI. Jetski. Fish the North and South Drops with the very best. Or just hang out and watch the boats. 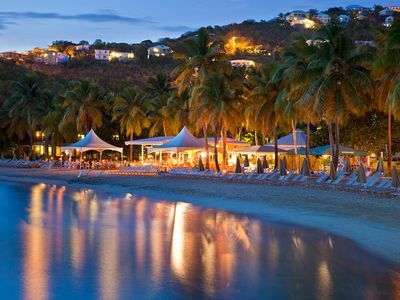 Lindquist Beach on St. Thomas is a short drive or cab ride. 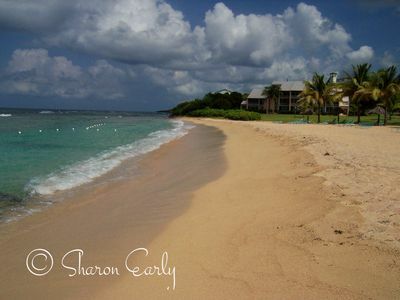 This beach offers calm clear blue water, soft sand, snorkeling and tide pools. 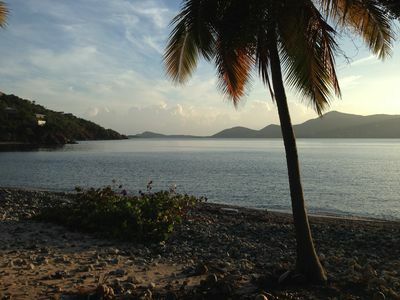 Lindquist is the most pristine beach on St. Thomas and is must see. Megans Bay beach is a one mile long beach that is protected from currents and waves and is St. Thomas most popular beach. It is the only beach where you have to pay an admission fee. These fees are used for maintenance and up keep. Shopping in Charlotte Amalie is tax free!! High end shopping such as Tiffany, Gucci, IZOD, Hilfiger, Louise Vitton and many other jewelry stores offer great products with great prices. Stop by the Yacht Haven Grande shopping area for many other shopping options. So bring your bikinis, flip flops and be ready to relax and unwind in the beautiful Caribbean sun! Watch this drone video taken of Sapphire Beach. 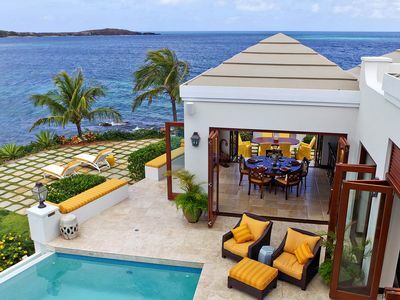 SOMEDAY ISLE: View, Pool, 1-3 BR, New kitchen and LV, gardens, great gathering. Ixora faired well in Irm-aria! 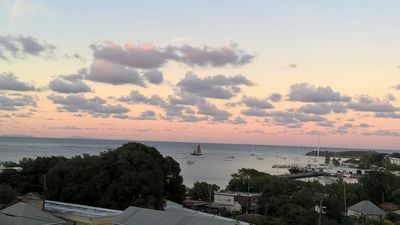 Enjoy amazing harbor views minutes to Magens! 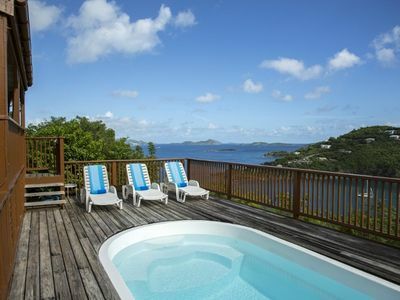 St. John Escape: Full Size 1 BDR End Unit: This Is the One You're Looking For! 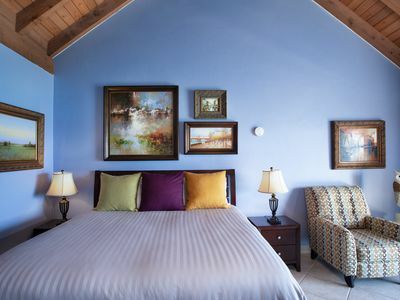 Amore Loft Suite - in the Heart of Cruz Bay! 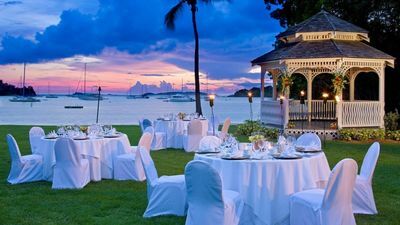 Best Deal for Sapphire Beach. Extra large studio. Beachside casual place. 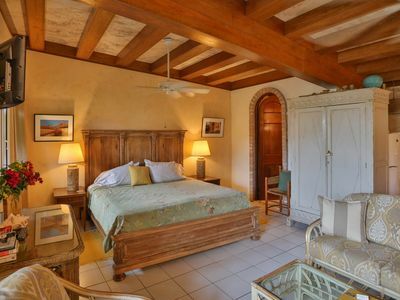 An artful retreat in the historic town of Christiansted, St. Croix. Sapphire Beachfront Renovated Villa 1,200 Sq Ft Free Wi-Fi High Season on SALE! It's Warm & Sunny! Spacious 2BR/2BA with Sweeping Views! Spring Specials!